I love creating adaptive books, and love getting them into the hands of kids even more. Use old, torn apart books and a quality laminator. Instead of buying brand new copies of books, ask libraries or teachers to donate their ripped books. A laminator will fix those ripped pages right up, and will give up a strong copy you can add velcro, glue, and felt too. Use a color copier to copy pictures from the book. Cut these pictures out, laminate them (with strong lamination – not your average school laminator), and velcro them into the book so that your child can take the Velcro’ed pictures on and off the pages. Consider the purpose behind your interactions: Think about the purpose of the story and how you want the child to interact with the book. You don’t need to make every picture in the book a touch and feel experiences. Although we often love having beautiful, detailed adaptations, this can create a distraction from the interaction with us, or the meaning of the story. What ideas are central to the story? How can you highlight that essential aspect so the child’s engagement will foster his understanding of the story? If the main idea on a page is that the tractor is sad, consider making the sad tractor’s face touch and feel, by tracing the face lines with glue, or adding an image of a sad face next to the trailer. 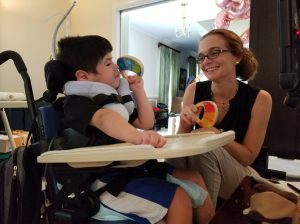 Think beyond matching: Although adapted books with velcro’ed pictures are great for working on a child’s matching skills, we can use them to foster more dynamic interactions. 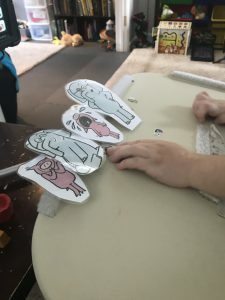 A child can line up the characters from the story in the order they appear, re-enact the story with the velcro’ed pictures, compare the sizes of the animals, or even compare the emotional change of the characters throughout the book. Position the book in a particular manner to encourage the chi ld to cross mid-line when he is taking a picture out of a book. Practice math skills by counting the lined up laminated characters. Use them to tell number stories at the child’s developmental level. Less is more: Often we can spend a lot of time making our adaptive books look cute and engaging. If you are someone who enjoys the crafting aspect of adapting books, and has the time to commit to the project, that is great. Yet we create engaging experiences without committing hours to laminating, velcro’ing, and felting our books. Sticky notes are a teacher’s best friend. Print off the pictures you’d like to use in your read aloud, tape them onto sticky notes, and place the sticky notes into the book. The child can take the sticky notes on and off the paper without ripping the actual book’s pages. While the sticky notes will get crumpled, you have not put significant time into this adaption, so it is not a loss. 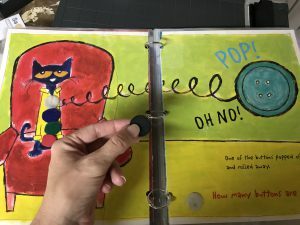 You can also tape tactile paper onto sticky notes and insert these sticky notes onto the book so that a child can still touch and feel the book.